The Advertising Standards Authority has agreed with a claim made in an ad for Gallaher Tobacco-owner Japan Tobacco International (JTI), which argued there was a lack of credible evidence that plain tobacco packaging would prevent children from starting to smoke, despite ruling against the claim in 2008. In a letter to the company – which owns brands including Silk Cut, Camel and Hamlet – ASA chairman Lord Smith said the regulatory body had revised its adjudication in part. Smith wrote: "In 2008, there was a lack of credible evidence that plain packaging would prevent young people from starting to smoke". 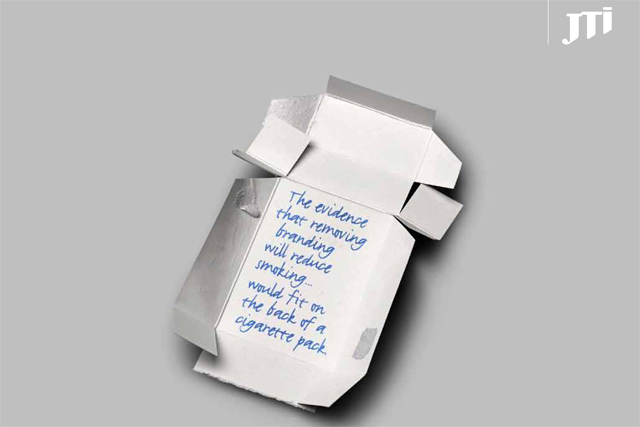 Daniel Torras, JTI’s UK managing director, responded by arguing that there is "no credible evidence today that plain packaging will have a positive impact". He added: "The soon-to-be-published Chantler review should have regard to this independent assessment, the views of successive Secretaries of State for Health that there is no evidence, and the Prime Minister’s view expressed in July 2013 that there ‘isn't yet sufficient evidence for it’, when reaching its conclusions." The original press ads, created by Big Al’s Creative Emporium, appeared in 2012 and featured an unbranded packet of tobacco. Text stated: "Everyone, us included, wants to prevent minors from starting to smoke. So, given the importance of the issue, why is the Department of Health consulting on a proposal which, a) has no evidence to support it and, b) common sense says won't work? In 2008, the same policy was rejected when it was found to have no credible evidence..."
Text in another ad stated "This same policy was rejected in 2008 because there was no credible evidence." However, the ASA maintains its ruling that JTI should not "claim that in 2008 the Government had ‘rejected’ the policy of plain packaging for cigarettes". The watchdog said of its revision: "We considered that JTI had substantiated that there was in 2008 a lack of credible evidence that plain packaging would prevent young people from starting to smoke. "However, we considered that readers of the ads would be likely to interpret the use of the word ‘rejected’ to describe that decision as a more categorical action than had in fact been taken, and as implying a degree of finality in 2008 greater than was in fact the case."